Extra: Try to draw the line of y = -3x + 9 after finding the x and y intercepts. Let's find the y-intercept. 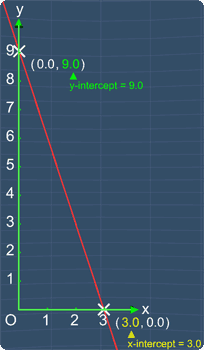 From the lesson, we know that the y-intercept is the y-coordinate of a point where the line crosses the y-axis. From the calculation above, we have the y-intercept as 6. As for the x-intercept, we know that the x-intercept is the x-coordinate of a point where the line crosses the x-axis. From the calculation above, we have the x-intercept as 3. Hence, by plotting these 2 points on the graph, we are able draw the line of y= -3x + 9 as shown in the picture. With the y-intercept as 9 and x-intercept as 3, the answer is C.